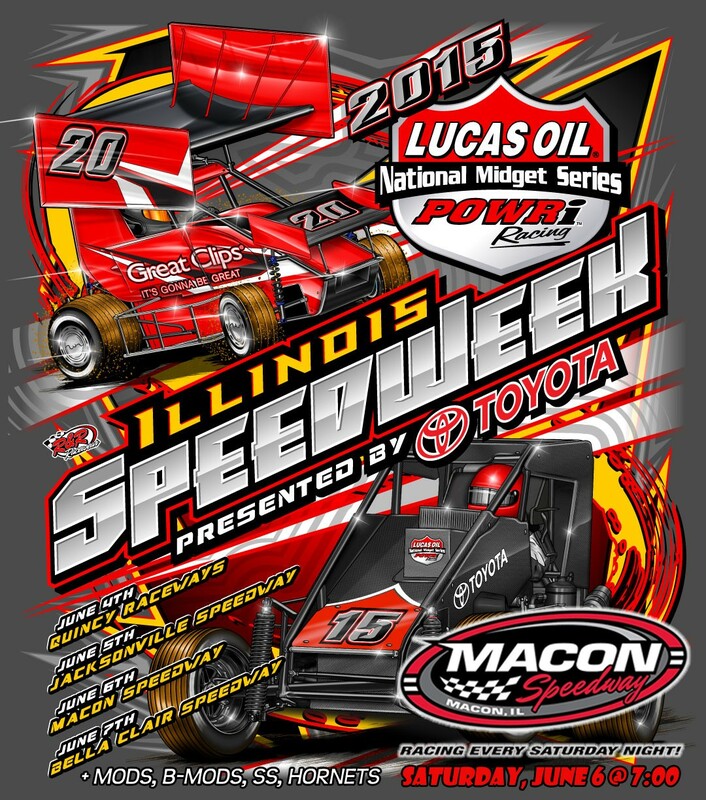 For the first time this season, the POWRi Lucas Oil National Midgets and the POWRi Speedway Motors Micros will be running sanctioned events at Mighty Macon Speedway. Two previously scheduled events were canceled due to rain but the forecast for tonight, Saturday, June 6 looks beautiful. Tonight’s events are all part of Illinois SPEED Week Presented By Toyota. The POWRi classes have put on amazing shows their first two nights this week. On Thursday at Quincy, 37 Midgets and 44 Micros were on hand with Tanner Thorson and Nathan Benson claiming the wins. Last night, 45 Midgets and 52 Micros put on a great show in front of a packed house at Jacksonville. Christopher Bell won the Midget event, while Bryan Urish claimed the Micro main. Night #3 at Macon will see the two POWRi classes in addition to racing from the UMP Billingsley Towing Modifieds, B-Mods, Street Stocks, and Hornets. A faster pastor race will be held at intermission. Pit gates open at 3:00, grandstands at 5:00, pill draw for Macon divisions ends at 6:00 when practice begins, and racing action will see the green at 7:00. Grandstand admission is $15 for adults, while children 11 and under are free.